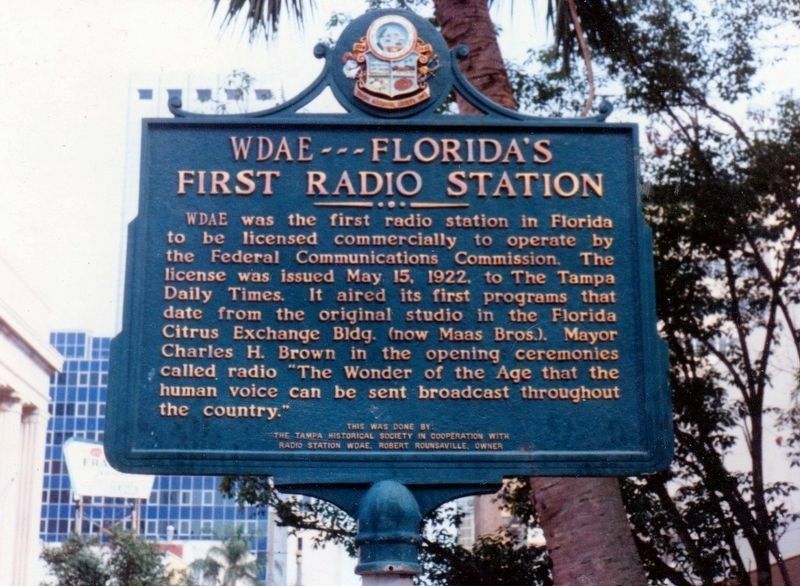 WDAE was the first radio station in Florida to be licensed commercially to operate by the Federal Communications Commission. The license was issued May 15, 1922, to The Tampa Daily Times. It aired its first programs that date from the original studio in the Florida Citrus Exchange Bldg. (now Maas Bros.). Mayor Charles H. Brown in the opening ceremonies called radio "The Wonder of the Age that the human voice can be sent broadcast throughout the country." Erected by The Tampa Historical Society in cooperation with Radio Station WDAE, Robert Rounsaville, owner. Location. Marker has been reported missing. It was located near 27° 56.986′ N, 82° 27.531′ W. Marker was in Tampa, Florida, in Hillsborough County. Marker was at the intersection of North Franklin Street and East Zack Street, on the left when traveling north on North Franklin Street. Touch for map. The former WDAE/Maas Brothers building has been demolished. Marker was in this post office area: Tampa FL 33602, United States of America. Touch for directions. Other nearby markers. At least 8 other markers are within walking distance of this location. Teco Energy's Tampa Electric Company (within shouting distance of this marker); Tampa Theatre (within shouting distance of this marker); Woolworth Sit-In (about 400 feet away, measured in a direct line); Federal Building (about 400 feet away); Sacred Heart Church (about 500 feet away); Courthouse Square (about 600 feet away); First Lt. Baldomero Lopez (approx. 0.2 miles away); The Salvation Army (approx. 0.2 miles away). Touch for a list and map of all markers in Tampa. More. Search the internet for WDAE ---Florida's First Radio Station. Credits. This page was last revised on February 25, 2019. This page originally submitted on February 24, 2019, by Tim Fillmon of Webster, Florida. This page has been viewed 36 times since then. Photo 1. submitted on February 24, 2019, by Tim Fillmon of Webster, Florida. • Andrew Ruppenstein was the editor who published this page.